The Pop Pluralism group art exhibition of thirty-one artists was held at the Jonathan LeVine Gallery in Jersey City, New Jersey from February 5th to March 5th 2005. 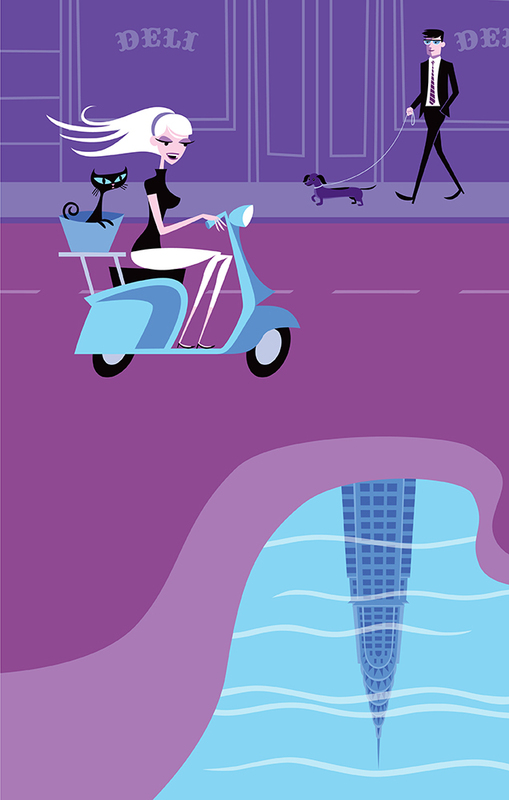 Josh Agle had two paintings exhibited at the show – Five Holes and Cycladic Figure in Landscape. 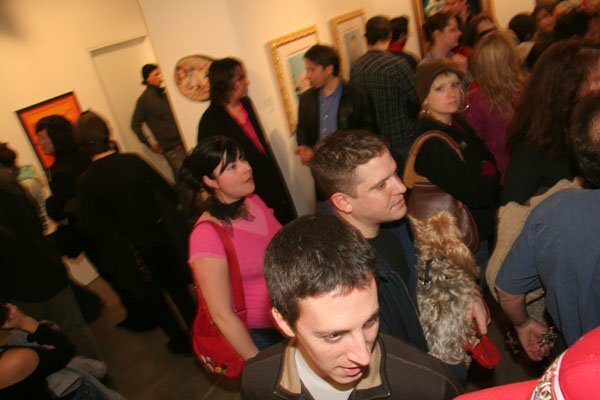 The Ruas de São Paulo: A Benefit Art Auction at the Jonathan LeVine Gallery in New Jersey ran from 7-10pm on Wednesday, January 31st 2007. 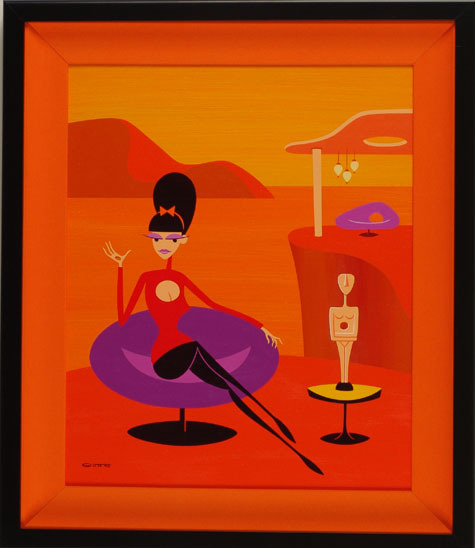 Thirty-two artists contributed work to the auction including Shag. It is unclear what work was shown. The True Self exhibition at the Jonathan Levine Gallery in Jersey City, New Jersey from October 24th to November 21st 2009. 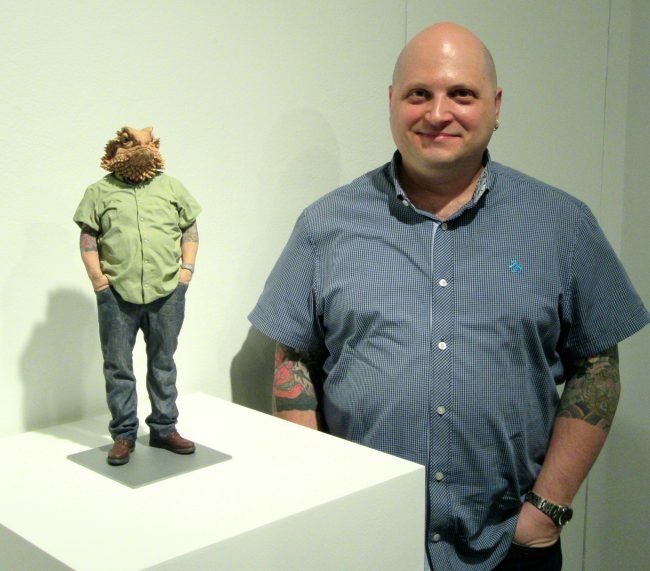 Shag exhibited the 13″ by 24″ painting Self Portrait with Black Liquid. 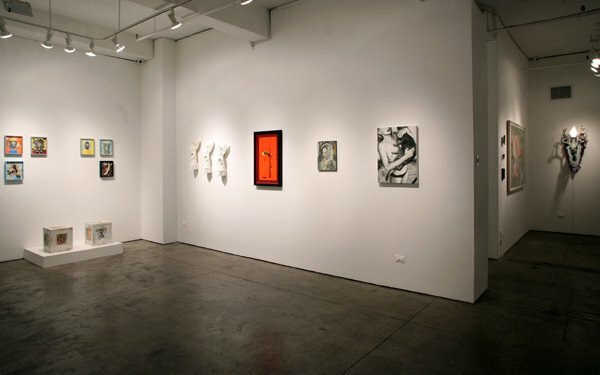 The Jonathan LeVine Gallery opened in the Chelsea district of New York City in 2005 and showcased new and cutting-edge art. 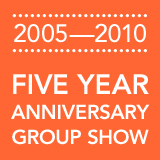 The Five-Year Anniversary exhibition was held from the 27th February to the 27th March during 2010 and celebrated artists pivotal to the gallery’s success. 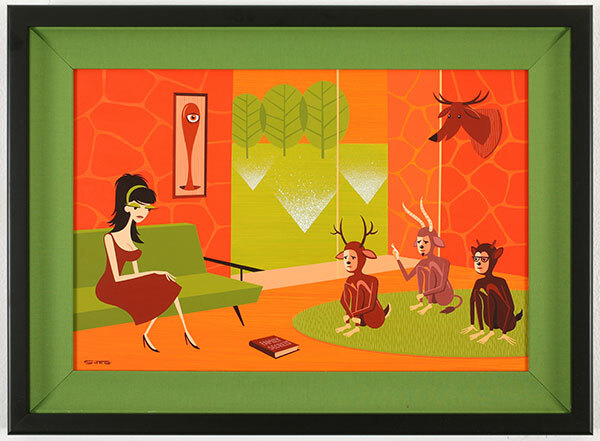 Shag contributed the acrylic on panel painting Family Secrets (sized 24″ by 16″) to the show. 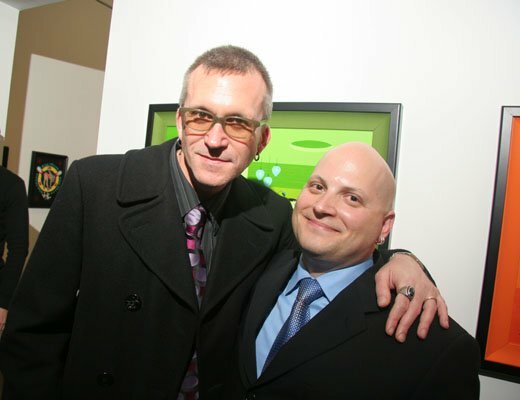 For reference, the newly renamed Jonathan LeVineProjects relocated to Jersey City in 2017 to focus on community and collaboration. 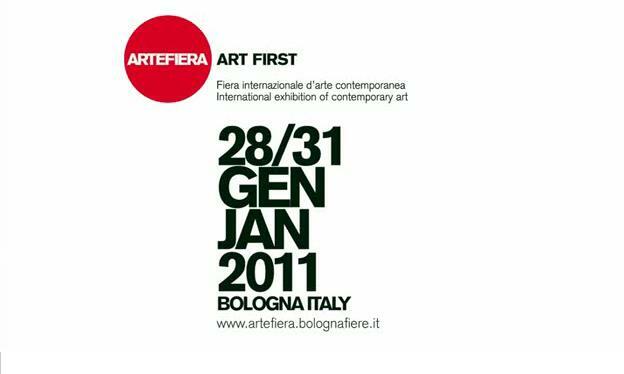 The Art Fair Art First event at the Bologna Exhibition Center in Bologna, Italy ran from the 28th to the 31st January 2011. 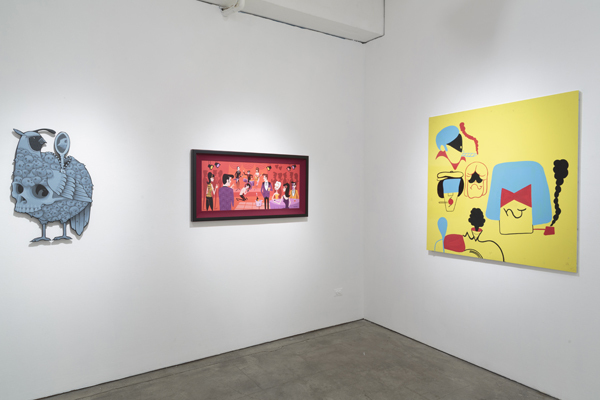 The 15,000 square meters of space was occupied by over 200 galleries including Jonathan LeVine Gallery from New York who included Shag’s work. 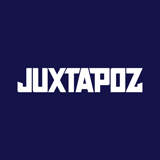 Juxtapoz magazine was launched in 1994 as a champion of the contemporary art world. 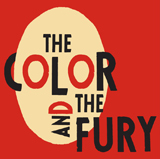 The vibrant and modern magazine promotes artists, galleries, and events that are often marginal and overlooked. 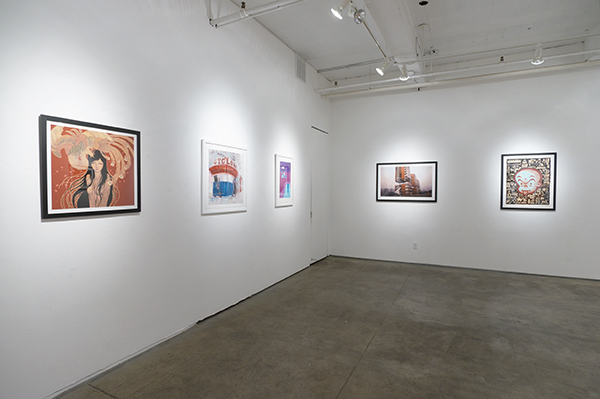 In 2014, Juxtapoz celebrated two decades in print with the Art Truancy: Celebrating 20 Years of Juxtapoz Magazine exhibition at Jonathan Levine Gallery’s two Chelsea spaces in New York. 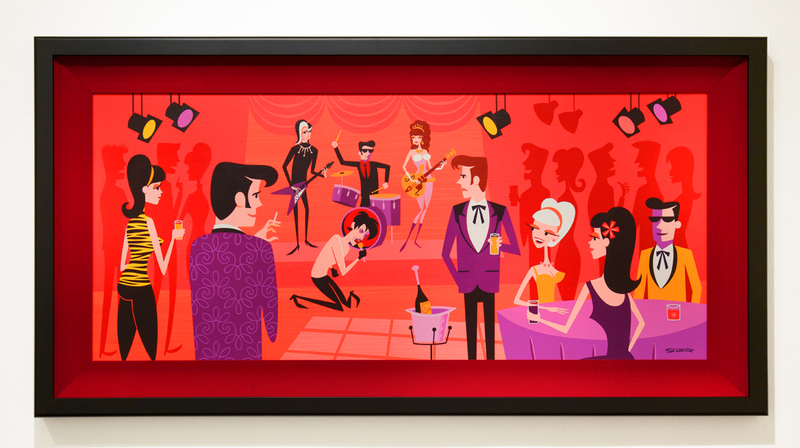 The exhibition ran from May 15th to June 14th and featured over forty artists including Shag who contributed the acrylic on panel painting At the Peppermint Lounge (sized 50″ by 18″). 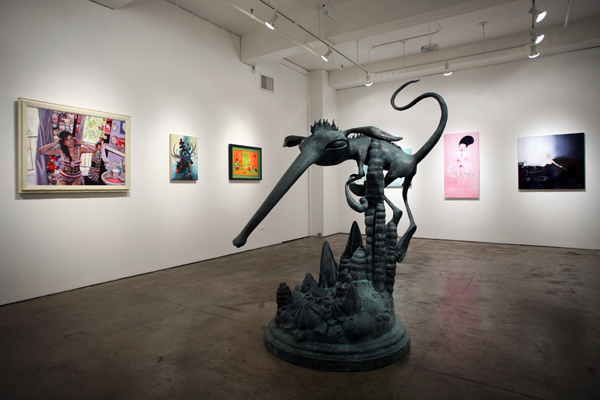 The ten-year anniversary exhibition of the Jonathan LeVine Gallery included many of the artists who have exhibited there over the past decade. 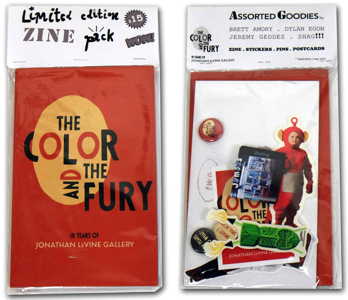 The Color and the Fury: 10 Years of Jonathan LeVine Gallery exhibition included ten limited-edition prints available for purchase in-person at the gallery or via the online store. 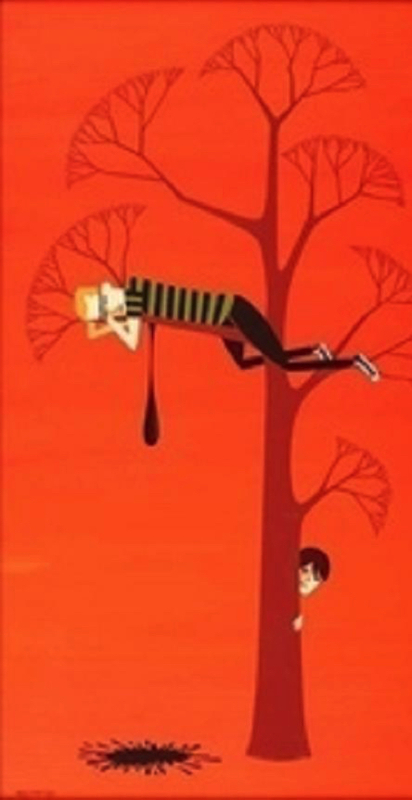 Shag contributed After the Rains, a fourteen-color serigraph print on two-ply museum board (24″ by 16″) with an edition size of 100 with accompanying CoA. 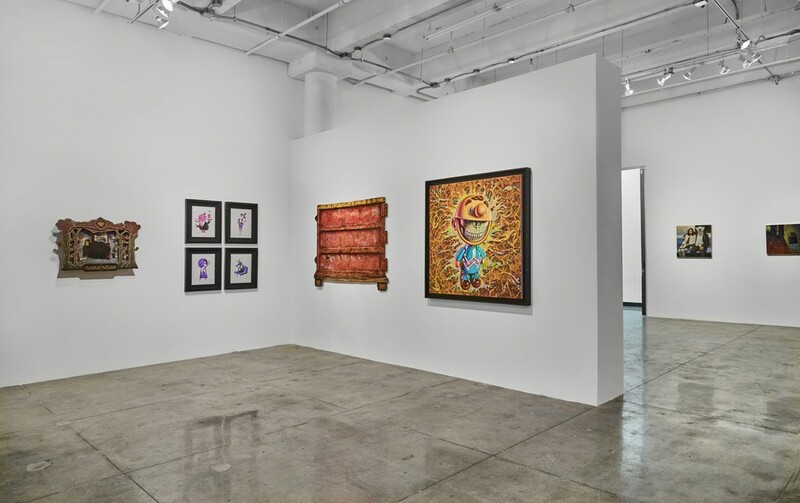 Welcome to New Jersey was the inaugural exhibition at the Jonathan LeVine Gallery’s new site at Mana Contemporary, 888 Newark Avenue, Jersey City. The show featured the work of over forty artists and ran from February 18th to March 18th 2017. 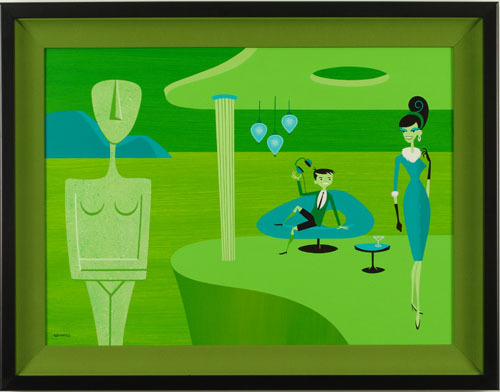 Josh Agle provided four small acrylic and ink on paper paintings – Russian Diplomat, Disappointed Donkey, Keyhole Girl, and Pink Elephant With Gin.